Dear Otto: How do I Teach Keyboarding in My Limited Class Time? My problem is that I only see each group of students (PK – 4th grade) once a week for 30min. I see 1st and 2nd grade two times a week. How do I successfully teach keyboarding AND my regular tech curriculum with next to no time to do both? I’ve thought about doing keyboarding for the first half of the year and then my curriculum the next half.. but I’m just not sure. I often get a version of this question–how can students learn to keyboard when there’s so little time allotted to teaching it? Surprisingly, it’s not as difficult as it sounds when you use a scaffolded approach. Start with pre-keyboarding in Kindergarten and first grade, move to good keyboarding habits that encourage speed and accuracy, and then blend it all into grade-level inquiry. PK, K, 1 are all about pre-keyboarding skills. Students need to understand the purpose of a keyboard, the mouse, tools and toolbars, basic digital citizenship safety, rudimentary problem solving. That can be done within the timeframe you’ve indicated. In fact, I lay it out in the K-1 curriculum that I publish. It’s easier than it sounds: Know what grade-level inquiry you can support and weave the tech skills into those. 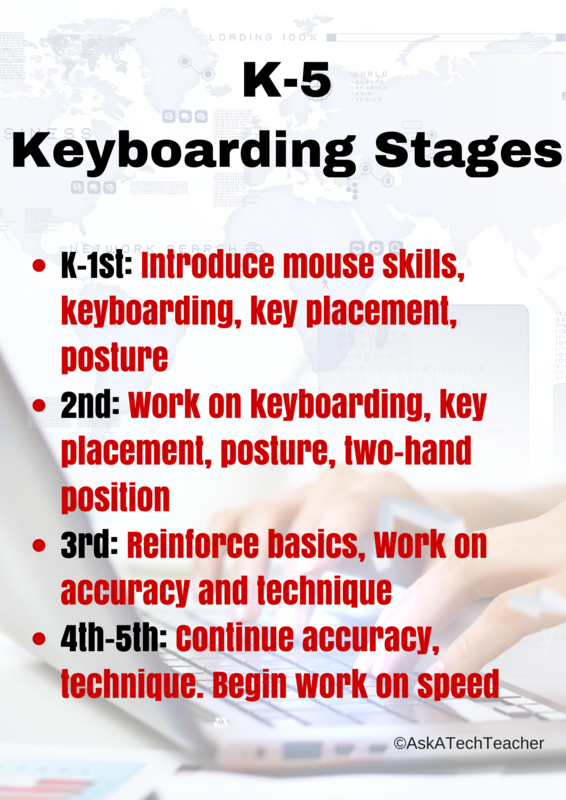 2nd grade: This year is quite similar to the approach you use in PK-1 but you address more specific keyboarding goals–like using more fingers. It can still be easily done in your available time frame. 3/4: Now it’s time to ramp up keyboarding expectations. You want them using all fingers, all hands, with good posture while thinking about speed and accuracy. Common Core expects one page in a sitting–300 words–in 4th grade. This is NOT doable if students aren’t typing 15-25 wpm. Even if you’re not a CC school, this is a good goal. You’ll need to reinforce good keyboarding habits at least 3x a week. Since you only see them 1x per week, that means homework (fun stuff like DanceMat Typing) or another member of the grade-level team reinforcing keyboard skills in their classes. As for teaching keyboarding and the regular technology curriculum, that shouldn’t be a problem. Technology is meant to be a tool for learning, not the goal. You wouldn’t teach keyboarding simply through rote drills because that isn’t authentic. It must be taught as a tool to communicate ideas–book reports, writing projects, research. It is granular, not the big picture. 7 Responses to Dear Otto: How do I Teach Keyboarding in My Limited Class Time? Glad to. The Almena Method of Touch Typing works. It has many product references and has been used in Canada for many years. The Washington DC School District has used it as well as some schools around the Country. Google it! Almena’s and my company Almena USA Training, llc, has been providing products to the market segment. Thanks, Dave. I have definitely heard of it. It sounds like a unique alternative.